Le Brunch is indeed available at some places in Paris, but I’m not necessarily at my best being around people first thing in the morning—and I’m not so fond of Le Brunch either. So I compromised on the more civilized hour of 1pm for dining on the weekends. 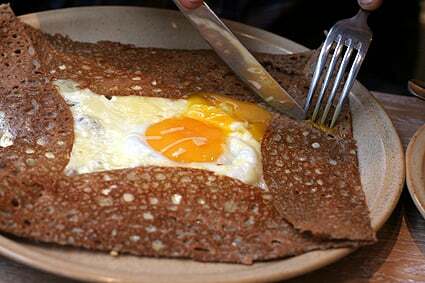 Not much is open in Paris on Sunday, so I had suggested Breizh Café, a tidy corner spot specializing in galettes de blé noir, commonly known as buckwheat crêpes. There’s no shortage of strollers or hipsters hanging out in this part of the Marais on Sunday. Once you get by all the folks peering in gallery windows, cigarettes perched in the corners of their mouth and the obligatory Sunday morning/afternoon dark glasses (whether it’s sunny or not), it’s a relief to find an inexpensive place to eat where the food is absolutely delicious. Oso wner Bertrand Larcher is a true Breton, the Breizh Café focuses on the quality of the products and lets them shine, rather than trying to mess with the originals: there’s no red pepper dust on the corner of the plate or twirls of squiggly balsamic sauces that have no business being there. 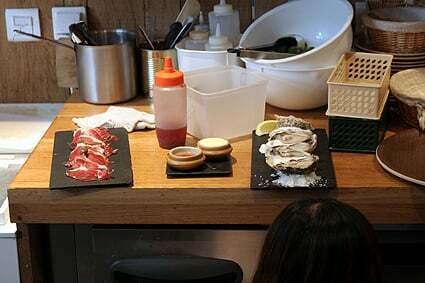 Some of the presentations—like the line-up of freshly-shucked oysters—reflects more of the Japanese sensibility of Larcher’s cuisine rather than the annoying need of other places to do something…anything…to be different. What is different here are the galettes. Each one on the menu is made with organic buckwheat flour and filled with premium ingredients, but not offered at premium prices. My Compléte au jambon cru de Savoie was filled with nutty, melted gruyère and topped with a lacy rosette of top-quality ham, rather than the industrial slabs of salty pork served at other crêperies. The butter is from Jean-Yves Bordier, which you can purchase to go (and I sure did! ), as well as his yogurt and rice pudding. 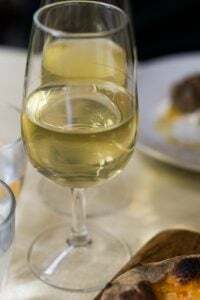 To swill with your galette, there’s a huge variety of artisan sparkling ciders, Breton cola, and my favorite; lait ribot, the French version of buttermilk that stunned the waitress a bit when we ordered two bowls of it. 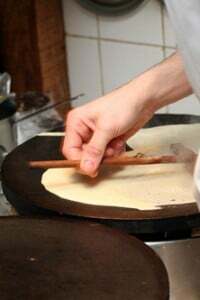 But judging from the crowd of Parisians, Japanese…and a couple of Brits and one American, the freshly-made galettes at Breizh Café seem to be universally loved by everyone—no matter where you’re from. The restaurants now offer online book through their website. In the Marais location, the Breizh Café Epicerie next door offers high-quality specialty foods from Brittany. I got nostalgic when I saw that picture of a galette. Egg, ham and gruyere is the only way to go in my opinion. If you ever wind up in Bretagne you should stop by the Crêperie de La Fontaine St Père in Plessala. They are a restaurant/factory kitchen. They have a huge window that shows them making galettes in their kitchen and they sell them to several supermarkets in the region. Every time my family comes back from France we grab a few dozen and put them in the freezer. They are that good. I have Breton friends in Paris…whose mothers send them galettes from Brittany—by mail! 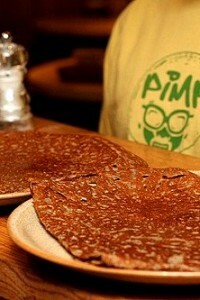 The buckwheat crepes sound just fabulous! Definitely something I’d love to try. That ham is gorgeous! I’m not a big breakfast person either, but I do try to make something substantive at least one morning a week. Actually, this looks so good I might have to make it for dinner tonight. I love doing breakfast for dinner. It’s perfect just before settling in to read for a few hours, especially in the winter. And that’s my game plan for this Thursday night. A new book, a heavy blanket, and now crepes with all sorts of deliciousness. I miss going out for galettes, and the homemade ones my hubby used to whip up. Will encourage him to approximate them here–must. I have to say that my favorites were eaten in Nantes at a crêperie in the old town. It was located inside a medieval building behind a church, on the Rue de la Sainte Croix. The crêpes were divine (especially the crème de marron dessert crêpe) but perhaps we loved it more because they gave me and my husband the biggest table in the place due to our accompanying dog (60 lbs. of fuzzy love) and brought her a huge bowl of chilled water before they even addressed us. 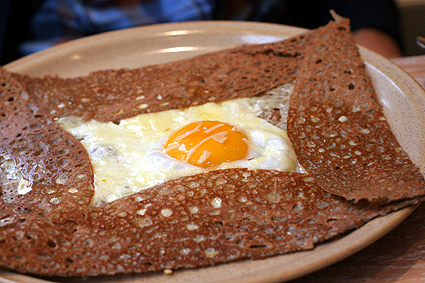 We checked out Crêperie Bretonne on your recommendation last time we were in Paris and loved the food there, the great price, and even the quirky, yet no-nonsense setting, more like a diner or all-day-breakfast place — certainly not a tourist haunt. But we tend to walk everywhere when we visit Paris, and we stay in the 13th, so even for us, that was a hike. 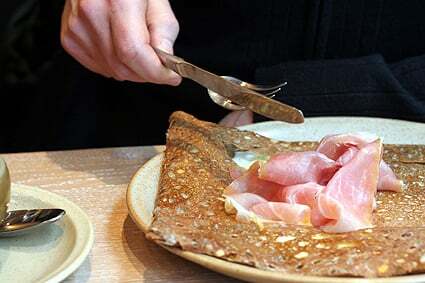 We’ll definitely check out the Breizh Cafe this time — buckwheat crêpes, yumm! But I still can’t figure out what the spoon was doing with the lait ribot?? 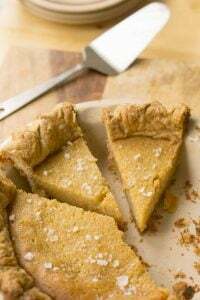 When I studied abroad in Brittany the summer before my senior year in high school, my family served galettes alongside bowls of buttermilk like that. The spoons were for dunking the (filled) galettes into the buttermilk. I tried it, but wasn’t really a fan. And that was the last time, until right now, that I’ve seen galettes with buttermilk. Maybe it’s from a certain part of Bretagne? I was in St. Brieuc that summer. But even in the other parts I’ve visited I’ve never seen it. To investigate this summer when I leave Lyon behind for a while and take off to Perros-Guirec! Gina’s right. 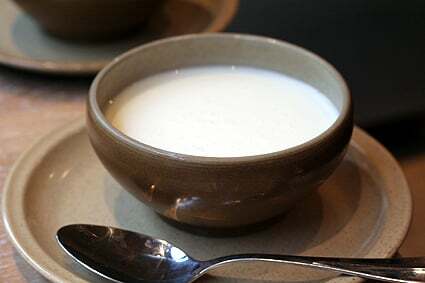 I just asked a friend of mine who is from that region, and he said the spoon is used to drizzle the lait ribot over the crepe, or that you tear off pieces of it and plunk it into the lait, then eat it with a spoon. Those crêpes look very tasty… I love breakfast food. Thanks for the tip on the Breizh Café. I hope I get a chance to go to Paris soon to check out it and all the great places you suggest. How long has the Breizh Café been open? I love the way it’s plated. It’s like Zen common sense. Or something, but it looks nice. And the lacyness of the crepe is superb! There must be hardly any egg in the batter? The spoon is a mystery to me. 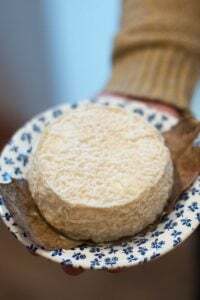 But I do have an aunt that dips pieces of galette in lait ribot and eats it like that. Not a lot of people do it and I’ve never seen it done so I don’t know if a spoon is needed. I still say the galette saucisse is one of the best ways to enjoy it. The fight song of Stade Rennais is called “Galette Saucisse je T’aime”. With fans like that you know that they got the best pre-game food outside the stadium. Thank you for being our window to Paris. We’re so looking forward to going there, but until then, we live Paris through you. Thank you so much. In the Touraine and nearby Berrichon, where we are in France, buckwheat is also called ‘sarrasin’. It was once an important crop in the Brenne – it grows well in wet areas. I often buy the very strong honey that bees foraging on this plant produce. I agree with Gael – galette saucisse is great food for an outside event. You can sometimes get it at Chef Shop in the US, but they’re out at the moment. It goes fast! Seriously, I’ve never had such great honey in my life. Last time I was there I bought 5kg—and wish I bought more! Wandering around a couple of months ago I came upon a street (in the XIVeme, I think) that was lined with nothing but creperies–like over a dozen of them. Any idea what that’s about? Your crêpe would be so much better with a pressed apple-juice (bio), or bubbly (alcoholized) cider? (Have never tasted such good apple juice as the ones from Brittany. And I like the cider. hic! lol!). Thanks for the link to your honey post – very interesting. I’ve had Italian chestnut honey, which I like, but its bitter overtone is so unlike supermarket honey it is rather a shock for the uninitiated. In Italy ‘amara’ (bitter), is considered desirable and healthful – a tonic. I’ve not had French chatainge honey, but I have seen it around. The sarrasin honey I get is produced locally in the Brenne (Indre) by Marie-Christine Tortiget and is available from the Maison du Parc/Pays and from le Grange des Dames in Angles sur l’Anglin in Vienne, as well as from her house. She is trying to ensure a traditional product continues but so little sarrasin is grown these days in the area. I’ve never had Bourdain honey. So far as I can work out, Bourdain/Black Alder is Common Alder (Alnus glutinosus). This is a common small deciduous tree that grows in very wet conditions and is easily recognisable by the conspicuous cones that stay on the tree throughout the winter. Honey on buttery toast is the best! I have eaten it for breakfast almost every day of my life. When I was a child, my mother made our butter, and I get the love of honey on toast from my father, who has also had it just about every day of his life. Oh my goodness, that first photo is a cross between my favorite breakfast foods: crispy crispy crepes and eggs over easy. Merci David!! I will definitely visit this cafe the next time I am in Paris! Since my grandmother was from Quimper I adore all things Breton and always say there is Muscadet in my blood!! I love that French food can be so simple, yet amazing. And I get so much inspiration from sites like yours. Just different ideas from the same ‘ol, same ‘ol California cooking I live amongst. Some of the best dishes in the world are actually the simplest. I was reading an article in the Guardian about Paris bloggers and hey presto, there you were! Know exactly how you feel about deadlines: get in there, David!! You cannot make me more happier! BZH! Vive la Bretagne :-) I’m from Nantes (Naoned in “breton” -regional language) and I love a good galette, hope you had a good “brut” cider with that menu. There’s a lot of good Galette places in the 14e arrondissement of Paris (near Montparnasse, the train station). I made these this morning for breakfast (minus the lait ribot)…. life is good. 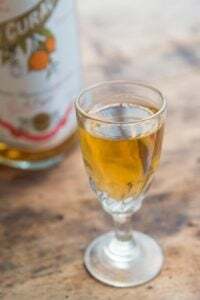 After a little research, I have discovered that it is miel de bourdaine (not bourdain) and bourdaine is Alder Buckthorn (Frangula alnus syn. Rhamnus frangula). 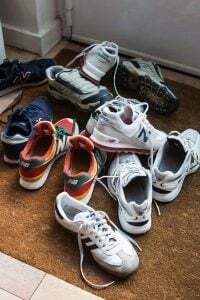 It is also known as Black Dogwood, Glossy Buckthorn and Breaking Buckthorn. French Laundry/Carol: Well, you’re doing much better than me (in the ‘healthy’ category.) 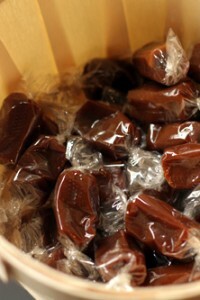 Today I made chocolate-covered toffee and a caramelized Almond Tart. Too bad we don’t live closer—we could’ve had a pot-luck! Babeth and Steve: Yes, the 14th is home to the street (Montparnasse) that’s lined with crêperies. Since the nearby train station serves, Brittany, there’s no shortage of crêpe places. I like that little one that’s no bigger than a phone booth that makes them fresh when you order them. kpg: I went to Ty Couz a few times when I lived back in SF, when they first opened. It was pretty good, but haven’t been back since. When you live in the epicenter of French cooking, it’s hard to eat it elsewhere. When I come to SF, I try to fill up on burritos, and stop when I’m just about to burst! Have you tried Truly Mediterranean in the Mission? I love that too! Susan: Yes, I corrected it in my comment. I’m on a deadline and didn’t have a moment to rifle through my stash for the right spelling. They told me when I bought the honey that bourdaine was used for gunpowder…which prompted me to look it up too! Mea culpa. I (belatedly) looked at your link to more favorite creperies and saw the answer to my last question. Sorry about that. Never met a Breton I didn’t like or a sarrasin crepe for that matter. But I’m so curious about this buttermilk thingy. I thought you couldn’t get that here and I have so many recipes that call for it. Word up to Ti Couz in San Francisco! I noticed that the honey in Bretagne is solid whereas the honey in the US is liquid. Why is that? I have been to their place in Cancale! I had NO CLUE they had one in Paris! Thank you for the address, I will hit it during my next trip!! GOD, I could eat my computer screen. la galette de sarrasin a une texture fabuleuse a donne vraiment envie. 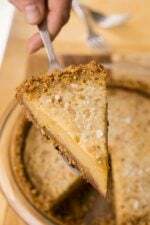 Chocolate-covered toffee AND an almond tart? That would’ve been a gorgeous breakfast dessert…. or it would have been nice after the liver & onions I just did for dinner. Breakfast, is my favorite time to go out to eat. I’m not really sure why, maybe it’s getting up in the morning and moving around. Plus, you get that first cup of coffee that tastes so great. I love the way the crepe is served with the egg in the center. Delicious! Runny honey has been subjected to a high heat process and then filtered to stop the granulation process, whereas solid honey hasn’t. Heating the honey like this also destroys the hydrogen peroxide (the antiseptic quality in honey). I know far too much about for the stuff for a man that doesn’t like it…..
Also, a lot of French people like crystallized honey for tartiner—spreading on toast. One of the honey vendors at my market asked me one why Americans never buy crystallized honey. I wonder how do most Americans eat honey? I never ate much before I moved here either (I mostly cooked with it), but now I’m hooked! And Joan, I also noticed the writer spelled my name and my website wrong, which leads to a counterfeit site full of ads…which doesn’t look very good for the newspaper—I guess they don’t fact-check over there since this is the second time that’s happened. That buckwheat pancake looks great with the sunny-side-up egg in it. 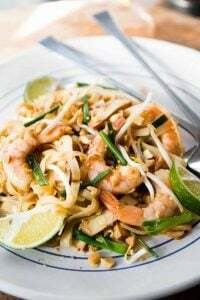 I have a strong aversion to anything buckwheat – probably since culinary school where we would make this asian salad with buckwheat noodles and a very acidic dressing heavy on sesame oil…PM Pantry…yuck – anyways – how buckwheaty are the crepes and would you opt for the regular batter rather then the buckwheat? I want to thank you for your post on gluten free in Paris, it is a wonderful resource and there isn’t much out there for resources.I am looking very forward to my trip, and researching has been a task! So, thank you very much. I do have one question: Since buckwheat is gluten free, why don’t you have this wonderful resource and breakfast/lunch/snack option listed in the gluten free post? Is there a huge cross-contact issue with the regular crepes? Since I have never been to Paris, and the last time I was eating crepes in France in the countryside, I did not have to think of this restriction, I was hoping to get your impiut before I got too excited. hmm what was the price like for the complète? We had lunch here on Saturday; we were lucky because the place was empty, which I understand is rare! We were stuffed after eating our galettes, but we were shocked to see two pencil-thin French people at the table next to ours each have a galette PLUS a dessert galette with ice cream. The French paradox is alive and kicking! I read with interest your recent article in the Washington Post food section about the Apricot and Raspberry Clafouti. I have enjoyed making clafouti’s, primarily apple, and was curious to know whether soy milk would work in these recipes? JeanneM: I’ve not tried it with soy milk, but if you do give it a go, let me know how it works out.